Fungal disease that forms an orange stain on the surface of foliage. Pustules form on the underside of leaves. This is mostly a cosmetic disease but can be treated with Garrett Juice with garlic or potassium bicarbonate. Rusts require two different plant species as hosts to complete their life cycle. Typical rust symptoms have a powdery tan to rust colored coating or soft tentacles. This is a disease that can be found on most turfgrasses, although zoysia may be the most severely affected. 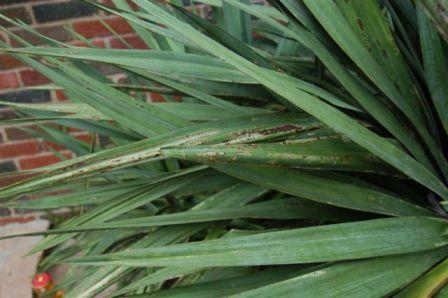 The rust develops orange or brown pustules on the leaves. If you get enough of these on a leaf, the plant’s ability to manufacture food is reduced and the turf thins out.